Manchester City captain Vincent Kompany is "worried" by his current injury problems, says the club's manager Manuel Pellegrini. Kompany, 29, made his comeback from a calf problem against Sunderland on Boxing Day but went off with a similar injury nine minutes later. 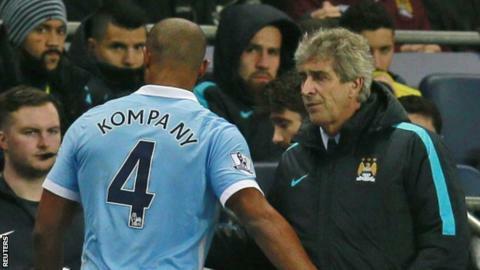 "He's the first one who is very worried about his situation," said Pellegrini. "That is why he is going everywhere to ask different specialists what is the reason." City's key defender has started just eight of City's 21 league games this season in addition to his brief substitute appearance in the win over Sunderland. The Belgium centre-half injured his calf against Juventus on 15 September last year and, despite briefly returning at the end of October, was missing again until the meeting over the festive period with the Black Cats. Kompany was expected to return at the end of January but Pellegrini has conceded his captain's return may not be as early as previously hoped. "I think that is the professional way to work when you have problems that don't allow you to play in your normal way," added Pellegrini. "I think you must find every way to see if you can find a solution. "Maybe there's not a solution or maybe this can be his last injury but I think he has a very good attitude and he is doing everything he can to return as soon as he can."